Detective Conan: A Popular Series That No One Talks About? Detective Conan is a manga/anime series about a high school detective who got drugged by a criminal syndicate which shrunk his body into that of a little boy. While trying to unearth the mysterious people behind the organisation, he continues to solve cases in his miniature form. The series is very popular in Japan but strangely I don’t see many people blogging about it. I have been following the manga since its debut in 1994. It is currently at volume 61 (in Japan) and is still going strong with no end in sight. I haven’t watched the anime (must be over hundreds of episodes by now) or it’s many movies (and probably never will). 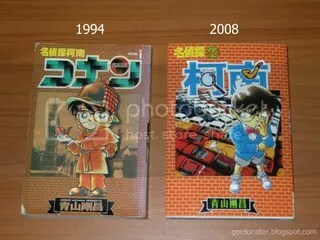 The picture above shows my volume 1 bought in 1994 and volume 60 released in Singapore last week. 13 Responses to Detective Conan: A Popular Series That No One Talks About? Detective Conan was what got me into anime. If not for it, I would probably not be what I am now. It is an interesting series, I actually read a bit of it when I was buying those bundled up comic magazines (Man4 hua4 zhou1 kan1) but I think the art style is not the most attractive to me so I’m not too upset when I don’t get to access it anymore. I only read to like 30ish volume. The begin is good and later get boring to me. I just hope it ends. 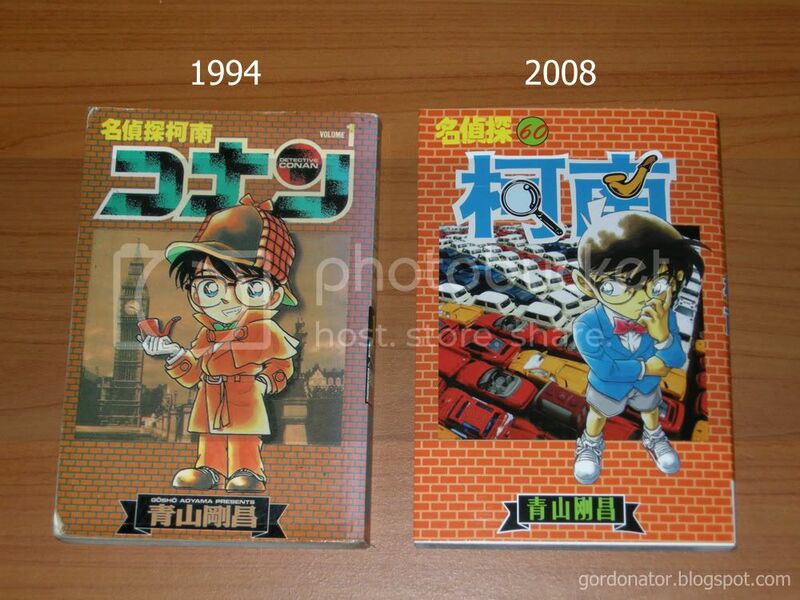 I mean come on Conan should have grown back to his true form by all these years, but he still look like a child. old is gold as they say. i still love the theme park case in volume1 classic beheading. the anime is over 500 episodes now. O_O guess i’ll just stick to the manga. I used to read this too, but the cases around volume 40+ started to get really confusing (and tiresome to read), so haven’t been following it for a long time now. he really should have grown up by abit. Conan is like a walking curse, murders occur everywhere he goes. If you think this is a long series, try reading 130+ volumes of Golgo13. the manga can be wordy at times but not as wordy as death note. anyway what language did u read yours in? online or hard copy? wow you are like my friend who also collected the entire series of detective conan. i read one piece as well (but not the anime). the latest chapter is damn funny. the sanji lookalike. lol. @Gordon, Haha, I guess you’re right about not being as wordy as Death Note.